I had a problem with my mac where I couldn't save any kind of file on the disk anymore. I had to reboot OSX lion and reset the permissions on files and acls. Permissions 0777 for '/Users/username/.ssh/id_rsa' are too open. What permissions levels should i give to the id_rsa file? 600 appears to be fine as well (in fact better in most cases, because you don't need to change file permissions to edit it). part of this file using 3DES. can (but need not) be readable by anyone. Then the solution posted here can be applied, 400 or 600 is OK.
GID 545 is a special ID that always refers to the 'Users' group, even if you locale uses a different word for Users. 600 for the keyfile "id_rsa"
There is one exception to the "0x00" permissions requirement on a key. If the key is owned by root and group-owned by a group with users in it, then it can be "0440" and any user in that group can use the key. I believe this will work with any permissions in the set "0xx0" but I haven't tested every combination with every version. I have tried 0660 with 5.3p1-84 on CentOS 6, and the group not the primary group of the user but a secondary group, and it works fine. This would typically not be done for someone's personal key, but for a key used for automation, in a situation where you don't want the application to be able to mess with the key. Similar rules apply to the .ssh directory restrictions. On Windows 10, cygwin's chmod and chgrp weren't enough for me. I had to right click on the file -> Properties -> Security (tab) and remove all users and groups except for my active user. Intersting message here. Operating Syatems are smart enough to deny remote connections if your private key is too open. It understands the risk where permissions for id_rsa is wide open (read, is edittable by anyone). While working on the multiple servers (non-production), most of us feel need to connect remote server with ssh. A good idea is to have a pice of application level code (may be java using jsch) to create ssh trusts between servers. This way connection will be passwordless. Incase, perl is installed - one may use net ssh module too. I've got the error in my windows 10 so I set permission as the following and it works. In details, remove other users/groups until it has only 'SYSTEM' and 'Administrators'. 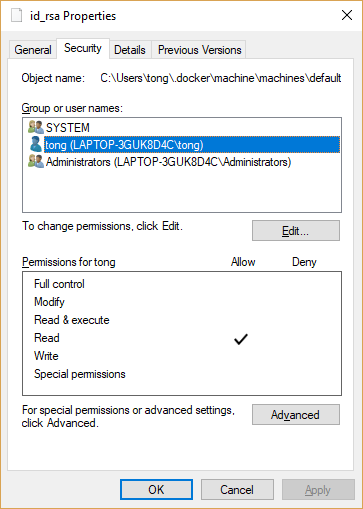 Then add your windows login into it with Read permission only. Note the id_rsa file is under the c:\users\<username> folder. after using chmod 400. It turns out that using root as a default user was the reason. I have came across with this error while I was playing with Ansible. I have changed the permissions of the private key to 600 in order to solve this problem. And it worked! for Win10 need move your key to user's home dir for linuxlike os you need to chmod to 700 like or 600 etc. Not the answer you're looking for? Browse other questions tagged permissions ssh or ask your own question.